Mishumo ya Vhaapostola 2:42-47 “42 Vha dzula vha tshi funzwa nga vhaapostola, vhe tshithu tshithihi, vha tshi ḽa vhoṱhe Tshilalelo, vha tshi rabela. Kutshilele kwa Vhakhriste vha u thoma 43 Mudzimu a ita maḓembe manzhi na mishumo i kanukisaho nga vhaapostola, lwe muṅwe na muṅwe a farwa nga nyofho.44 Vhatendi vha ḓi dzula vhe tshithu tshithihi, zwe muṅwe na muṅwe a vha e nazwo zwo vha zwi zwa vhoṱhe, 45 vha tshi ita vha tshi rengisa masimu avho na thundu dzavho, vha tshi kovha nga hune vha vhona muthu a tshi lila ngaho. 46 Ḓuvha ḽinwe na ḽiṅwe vho vha vha tshi ḓi kuvhangana thembeleni vhe vha mbilu nthihi, ḽi tshi u tsha vha ḽa fhano ḽa tsha vha ḽa fhano, vho takala vha si tshee na tshiṅwe tshine vha tama, 47 vha tshi renda Mudzimu, na vhathu vhoṱhe vha tshi vha takalela. Ḓuvha ḽiṅwe na ḽiṅwe Muṋe washu a ḓi vha engedza nga vhe vha vha vha tshi khou tshidzwa. (VEN98). Vhaefesa 4:11 i amba u ri "11 Ndi Ene mukovhi wa mpho hedzi: vhaṅwe o vha ita vhaapostola, vhaṅwe a vha ita vhaḓivhadzi vha zwe Mudzimu a dzudzanya, vhaṅwe vha vha vha u tshimbila vha tshi ḓivhadza mafhungo maḓifha, vhaṅwe vha vha vhalisa na vhafunzi." (VEN98). Vhaḓinda vha Mudzimu (vhaapostola, vhaporofita, vhaambi vha mafhungo maḓifha, vhalisa na vhafunzi) vho kovhelwa kereke u ri vha gudise vhathu zwavho (lay people), u ri vhathu vha kone u isa phanḓa na mushumo wa Mudzimu, ngomu kerekeni na nga nnḓa ha kereke. Kha Mishumo Ya Vhaapostola 2:42-47 ri wana u ri ho vha hu na miṱangano mivhili ye kereke ya mathomoni ya vha i tshi i fara. Vho vha vha sa dzuleli u ṱangana Thempeleni (kerekeni) fhedzi, ḓuvha liṅwe na liṅwe miḓini yavho vho vha vha tshi ḽa tshilalelo, vho vha vha tshi pfana. Ho vha hu na vhuḽedzani. Maḓuvhani a u thoma a kereke, ho vha hu na vhaKriste vha 100,000 Jerusalema, kha vhathu vha 200,000. Ndi nnyi we a vha a tshi nga zwi kona u ṱhogomela avha vhathu vhoṱhe, sa izwi ho vha hu na vhaapostola vha 12 (fumi na mmbili) fhedzi? Zwi amba u ri ho vha hu na vharangaphanḓa vha zwigwada zwiṱuku – zwa vhuḽedzani ha thabelo ya muḓi-nga-muḓi. Vhenevho, kathihi na madikoni a sumbe (Mishumo Ya Vhaapostola 6), vharangaphanḓa zwavho (lay leaders) vho kovhekana vhuḓifhinduleli ha u tshimbidza mushumo wa thabelo ya muḓi-nga-muḓi. Miṱangano ya thabelo ya muḓi-nga-muḓi, nga fhasi ha murangaphanḓa, i vhonala i yone nḓila nthihi fhedzi, ye vhatendi vha vha vha tshi nga kona u ṱhogomelwa ngayo. Hezwi zwo vha zwi tshi khou ita u ri kereke i dzudzanyee zwavhuḓi lune ya kona u ṱhogomela ṱhoḓea dza tshivhidzo tshi no khou aluwa. Zwo vha zwi tshi nga konadzea hani u ri kereke yeneiḽa ya mathomoni i kone u ṱanganedza vhatendi vhaswa vha 3000 nga ḓuvha ḽa u thoma, musi Muya Mukhethwa U tshi wela kha vhatendi nḓuni ya nṱha nga duvha la Pentekoste? Ṱhoḓea dza havha vhathu dzo vha dzi tshi ṱhogomelwa miḓini, hu si Thempeleni. “21 Huno kha vhathu havha nga vha nange vhanna vhane vha kona, vhane vha ofha Mudzimu, vha fulufhedzeaho, vha sa pfani na zwa tshanḓanguvhoni, vha vha vhee uri vha vhe vharangaphanḓa vha vhathu: vharangaphanḓa vha no langa tshigidi, vha ḓana, vha mahumi maṱanu, vha fumi. 22 Nga vha ite uri vhathu avho vha shumele vhathu vha tshi vha sengisela mafhungo avho tshifhinga tshoṱhe. Milandu i konḓaho vha nga i ḓisa kha vhone, hone milandu miṱuku vha nga i dzudzanya vhone vhaṋe, u ralo ha vha u vha leludzela zwithu na u ṱhaḓulana muhwalo na vhone.” (VEN98). U hweswa maanḓa (delegation of authority) ndi zwithu zwine zwa wela nga fhasi ha lufuno lwa Mudzimu. Mufunzi wa kereke o hwesa maanḓa (e na vhone vha hweswa nga Mudzimu) avho kha vharangaphanḓa vha dzithabelo dza muḓi-nga-muḓi u ri vha vhe vhone vha no ḓo ranga dzithabelo dza muḓi-nga-muḓi. Acts 2:42-47 “THE BELIEVERS FORM A COMMUNITY 42 All the believers devoted themselves to the apostles' teaching, and to fellowship, and to sharing in meals (including the Lord's Supper), and to prayer. 43 A deep sense of awe came over them all, and the apostles performed many miraculous signs and wonders. 44 And all the believers met together in one place and shared everything they had. 45 They sold their property and possessions and shared the money with those in need. 46 They worshiped together at the Temple each day, met in homes for the Lord's Supper, and shared their meals with great joy and generosity— 47 all the while praising God and enjoying the goodwill of all the people. And each day the Lord added to their fellowship those who were being saved.” NLT. [own emphasis]. Eph. 4:11 it states that God "gave some to be apostles, some to be prophets, some to be evangelists, and some to be pastors and teachers, to prepare God's people for works of service, so that the body of Christ may be built up" (NIV). God's servants (apostles, prophets, evangelists, pastors and teachers) are given to the Church to equip the lay people, so the lay people can carry out ministry, both inside and outside the Church. In Acts 2:46-47 there were two types of meetings in the early church. Not only did the disciples gather regularly at the Temple (church), but they also met together daily in their homes to break bread and to have fellowship. In the early days of the Church there were 100,000 Christians in Jerusalem, out of a population of 200,000. Who could have taken care of all those people, since there were only twelve apostles? How could they take care of the house-to-house ministry? There had to be leaders of smaller groups—of house fellowships. Together with the seven deacons (Acts 6), the lay leaders would have had to share the responsibility of carrying out house-to-house ministry. The only way for the believers to be taken care of in the house meetings was for each of those fellowships—or cell groups—to have a leader. The church, then, was well-organized to minister to the needs of a growing congregation. How else could the early church have absorbed 3,000 converts on the first day, when the Holy Spirit fell on the believers in the Upper Room on Pentecost? The needs of those people were taken care of in the homes, not in the Temple. "But select capable men from all the people—men who fear God,” Jethro told him, "trustworthy men who hate dishonest gain—and appoint them as officials over thousands, hundreds, fifties and tens. Have them serve as judges for the people at all times, but have them bring every difficult case to you; the simple cases they can decide themselves. That will make your load lighter, because they will share it with you" (Exod. 18:21-22, NIV). Delegation of authority is definitely part of the will of God. 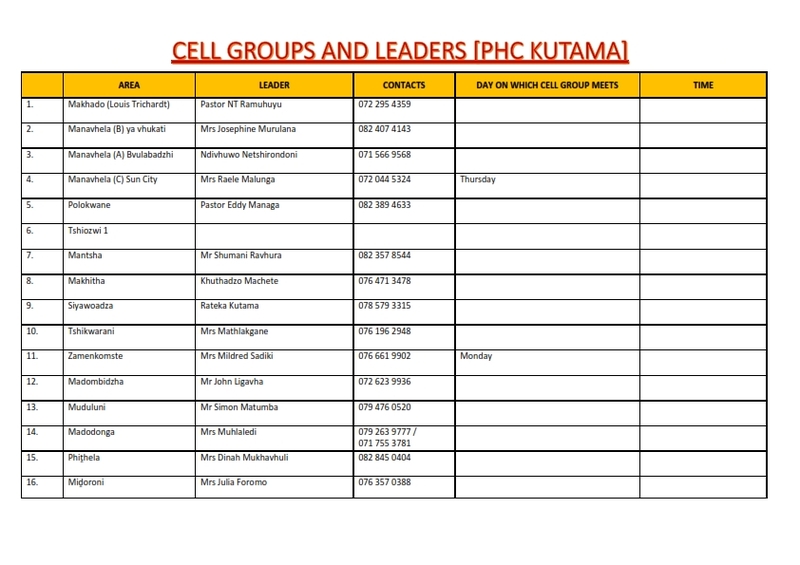 The pastor of the church has delegated his authority to the appointed cell group leadership.